2nd Prizes x4 : a branded 55” Full HD TV worth RM4,500 each. 3rd Prizes x8 : a GoPro Hero 4 Camera worth RM1,800 each. Special Prizes x18 : an Acer Iconia Tab 8 W worth RM529 each. Purchase any eligible Acer Product powered by Intel processor from selected authorized Acer retailers during the Contest Period. Find and circle three (3) hidden words (Acer, Intel & Why Not) in the word puzzle in the Why Not Win A Mazda3 contest form. Fill in your personal particulars in the requisite contest form. Send the form via Facebook, fax or email with attachment, to the Program Centre. Retain your original paid invoice and/or receipt as proof of purchase. EndUser/Purchaser may be required to present original proof of purchase when receiving their gift/prizes. 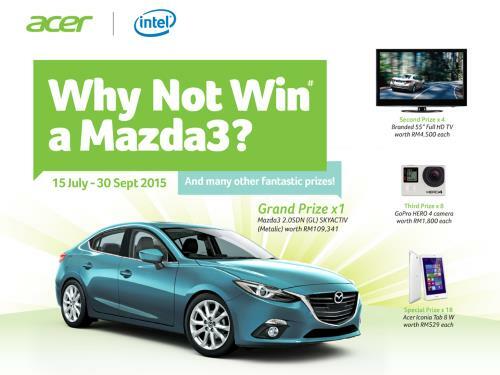 Visit Why Not Win A Mazda3 Contest for more details.